There were 3003 Special Limited Edition "Feature" LX 5.0L convertibles produced in 1993. A quantity of 1503 were painted exclusive Canary Yellow with either a black or white interior and top combination and chrome wheels. Another 1500 were painted Vibrant White with a white interior and top combination and white wheels. These cars had rear decklid spoilers and 16-inch 5-spoke Pony wheels. The front seat headrests and floor mats have a Pony embroidered on them. Vibrant White 1993 Mustang Limited Edition "Feature" 5.0 LX convertible with a 205hp (at 4200rpm), 5.0 liter (302ci), high output V8 engine. The white exterior color, white convertible top and white interior combination was sometimes called triple white. "Feature" cars also came in yellow. The white wheels are standard with the "Feature" edition. 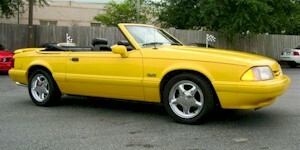 1503 of these yellow 5.0L LX special "Feature" convertibles where built in 1993. This one is Canary Yellow and came with the 5.0L V8 engine, rear decklid spoilers, 16 inch 5 spoke wheels, and black leather interior with a pony embroidered headrest. 1500 of these Feature cars also came in Vibrant White. This is a Ford promotional photo which we also have in a 3072 X 2048 pixel wallpaper size. 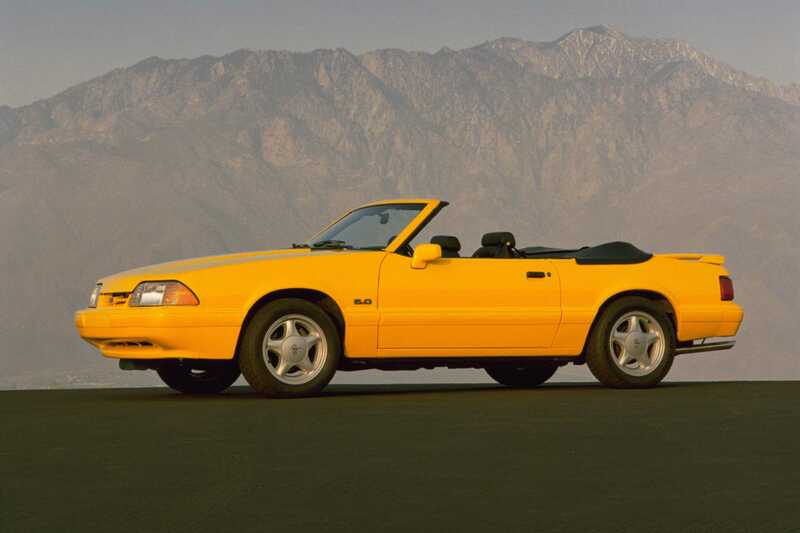 Canary Yellow 1993 Mustang Limited Edition 5.0L "Feature" convertible with bright chrome 5-spoke wheels, white interior, and color matched mirrors and moldings. Very bright car, even on an overcast day.